Abigal Arias has a stage-four Wilms' tumor wrapped around her aorta. She went into remission for five months, but then the cancer spread to her lungs. Abigail's doctors don't know of any treatment or chemotherapy that is able to cure her, CBS affiliate KHOU-TV reports. The department invited Abigail to be sworn in as an honorary officer Thursday, under one condition: Garivey made Abigail make a promise in her oath. "I now and forever promise to keep fighting the bad guys until all my cancer's gone," she said. The chief couldn't hold back his tears while swearing in the terminally ill girl. 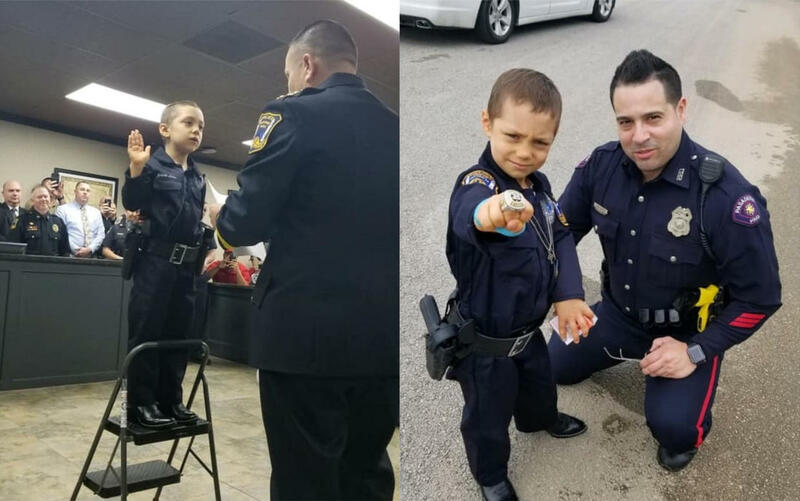 He was overcome with emotion as Abigail received her badge, which she wore on her tiny police uniform. Edited 2 time(s). Last edit at 02/09/2019 12:29PM by pRICE cUBE. I would like to applaud Abigail's fighting spirit as she battles this disease. I hope I could have a fraction of her fighting spirit in the face of unfavorable odds. The police department's gesture is highly commendable. I would encourage people to donate to worthy charities that relate to this story. This thread has been locked due to it going WAY off topic.